Nostalgia is an important part of gardening, however much we might pretend otherwise. A childhood memory of marvelling at the towering stems and fizzing colours of hollyhocks makes me take a short detour, every year, past a cottage that lies hidden behind a forest of the plants. Hollyhocks might now be seen as quaint, old-fashioned plants whose gaudy flowers are unsuited to contemporary planting schemes but for generations of gardeners few other perennials have been as imposing, colourful and easy to grow. 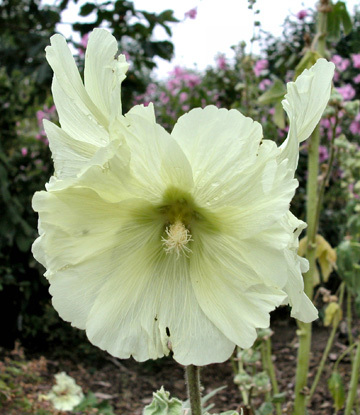 The hollyhock, Alcea rosea, has been in grown in Britain since the mid-sixteenth century, when it arrived from either China or from western Asia. For a time it was known as Althaea rosea, as in the RHS encyclopedia of 1951, with a note that Alcea was an out-of-date name. It is now back to being Alcea but you might find it in nurseries under both names (or even, erroneously, as Althea). They are part of the Malvaceae family that includes other familiar garden plants such as Abutilon, Sidalcea and Hibiscus. The colour of hollyhock flowers ranges from pure white to dark purple, and plant breeders have produced varieties with double and semi-double flowers. They are naturally perennial but in the garden can be treated as biennial and, sometimes, as annual plants. Their main flowering period is during July and August. Alcea rosea ‘Halo White’ produces flowers in its first year after sowing so is one of the cultivars that can be used as an annual. It has single white flowers with a pale lemon centre. It looks particularly dramatic when grown with the almost-black variety, A. rosea ‘Nigra’, which, although known as the black hollyhock, has flowers that are, in fact, deep purple. It is worth buying new seed each year rather than collecting your own from this plant. Home collected seed tends to produce pale imitations of the true form. To ensure consistency in the shape and colour of their flowers the double-flowered varieties also need to be grown from bought seed. A. rosea ‘The Bride’ has a pom-pom of white petals that are surrounded by a collar of single petals, making it less blousy that the fully-double varieties. The most widely-available group of double-flowered hollyhocks is the ‘Charters Strain’. These are often sold as mixed colours but single colour strains are available. ‘Charters Red’ is probably the best of the deep red varieties. Plant breeders have also come up with dwarf hollyhocks. Several seed companies sell them under the name of Alcea ‘Majorette Mixed’. They are absurd little plants that turn majestic spires of vibrant color into squat, ugly stumps. The problem with all the Alcea rosea cultivars is that, sooner or later, they become covered in rust. Known as hollyhock rust, Puccinia malvacearum is specific to plants in the Malvaceae family and is both an eyesore and has a debilitating effect on the plant. The traditional method of dealing with rust was to spray with a fungicide, beginning in May and continuing through the summer. A more reasonable solution is to treat hollyhocks as annual or biennial plants, removing and burning the infested ones as soon as they have finished flowering. You will still get rust on your plants but it won’t completely disfigure them. Gertrude Jekyll wrote about hollyhock rust in the late 19th century but she continued to grow them. Since then varieties have been bred that have some resistance to the problem. Several hollyhock relatives are far less susceptible to rust. Althaea cannabina (despite the name the foliage is only vaguely reminiscent of cannabis) has tall, wiry stems that grow up to six feet tall. Its flowers, pale pink with a raspberry centre, are like miniature hollyhocks and the plant is covered in them from late summer. The individual flowers are about an inch wide and grow from the leaf axils. Despite its height the whole plant has a delicate, diaphanous quality. Don’t be put off by its weedy, insignificant appearance on the nursery bench. It is one of those plants that only grows well when it can get its roots deep into the soil. Althaea armeniaca is a very similar, shorter, plant and the two are often confused. Althaea officinalis, the marsh mallow, is also less susceptible to rust. A British native that grows to about three feet tall, it is becoming increasingly rare in the wild. The tough foliage is grey and velvety and the plant is covered with small pale pink, almost white, flowers in August. There is a cultivar with darker pink flowers than the species called Althaea officinalis ‘Romney Marsh’. The name refers to one of the few areas of Britain where the plant is found. The plant is also found throughout much of Europe and was used by a pair of Hungarian plant breeders to produce a new range of hollyhocks. Their aim was to introduce the toughness and disease resistance of the native species into more colorful hybrids. Originally going under the name of Malva, they are now known as x Alcathaea. As the original breeders wanted, they combine the height and flamboyance of cultivated hollyhocks with the resilience and hardiness of species plants. ‘Parkallee’ has flowers made up of 4cm long pale-peach petals that overlap spirally to form a full, though not double, flower. ‘Parkrondell’ has similar, rosy-purple flowers. Sports have appeared on both varieties and other breeders are looking at similar plants so in the next few years we may see many more of this type of hybrid. As children, the upturned flowers of hollyhocks, with a bud of the same colour stuck on top, became swirling ballroom dancers. Christopher Lloyd writes that when he played with the flowers they were fairies with glamorous skirts. I think it was probably only we sissies who played like this with hollyhock flowers. This was only part of the attraction of the plants, so don’t let that put anyone off growing them. Now that new hybrids are reproducing their toughness, stature and vibrancy in disease-free plants more gardeners will rediscover their charms.